Eggplant, aubergine, is a kigo for haiku. The origin of the Japanese word comes from 中酸実（なかすみ）nakasumi, slightly vinegar taste, and 夏実（なつみ）natsumi, fruit of summer. Main producing areas are Kochi, Kumamoto and Fukuoka. Its purple was also a favorite color of the peopole of Edo 江戸庶民のおしゃれ、茄子紺色. goroawase - numbers sounding like ..
aonasu, ao-nasu 青なす "green eggplant"
This is a regional plant, also called "white eggplant". It has been introduced in the early Meiji period and used for Narazuke pickles, eaten in miso soup or boiled with other vegetables. It had been out of production after the war. Local people have now helped to plant this aubergine again and bring it to a large size, some even reach one kilogram, the average is 300 gram. The meat is lightly green and crunchy. The menu in town offers various dishes, even sweet pie and jam, but the traditional dengaku with sweet miso seems the best. The harvest is from mid-July till beginning of October. 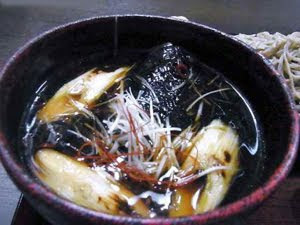 mizunasu, mizu nasu 水なす　"water-eggplant"
speciality of Senshu district in southern Osaka Prefecture. They are round and very juicy and have a beautiful shine. You can even squeeze the liquid out of a freshly harvested plant. The plants stand in water during the rainy season. They can be harvested from July till late in October. They taste delicious as asazuke, lightly pickled. But it is also used locally for curry or fry dishes. Here we look at some dishes with this plant. "After we confined ourself in Haguro-Sanzan Shrine to pray for seven days,we have come down to Tsuruoka Town. Then we are given a warm welcome at Nagayama Juko's residence. How delicious the new egg plants are at the dinner." Matsuo Basho in May of the year Genroku 7 (1694), on his last trip to Kansai. Basho was not feeling well at this time and the prolonged stay at the inn might have been a good rest for him. The chisa lettuce had been introduced from China during the Heian period. Now we can eat it all year round, but in the time of Basho, it was a spring food, and served here out of season, with the early eggplants of summer. Basho expressed his thanks to the host family with this haiku. This is a district full of Tengu legends. Even plants are influenced by him.